Articles by "EC Cluj 2017"
The event finals of the 2017 European Championships were held on 22 and 23 April in Cluj-Napoca, Romania. They were two days of fierce competition, high intensity, big emotions, stunning victories and heart-breaking defeats. Eight different nations medalled in four event finals, a sensational result for smaller programmes, as well as exciting news in general for the future of the sport. The vault final was won by France’s first-year-senior Coline Devillard, who performed a Rudi and a DTY, both with a big step back, for a total of 14.467 (14.633/5.8 and 14.300/5.4). Second was Great Britain’s Ellie Downie with a 14.350. Downie scored a 14.400/5.4 for her DTY and a 14.300/5.2 for her Lopez. Hungary’s Boglarka Devai was third with a 14.317 and also competed a DTY and a Lopez (14.400/5.4 and 14.233/5.2). The Olympic silver medallist from Rio 2016, Russia’s Maria Paseka finished just outside the medals in fourth place (14.283). Paseka was the only gymnast to perform the Amanar vault, but her execution was really messy, and her Lopez was wild in the air and in the landing. It was a historic victory for Coline Devillard, who is the first French female gymnast to win a European vault title, as well as the first female gymnast to win a European title since 2005. History was made also on the uneven bars, when Nina Derwael became the first Belgian gymnast to win a European title on this apparatus. Derwael hit her intricate bars routine, which included a super difficult stalder Tkatchev with half turn linked to an Ezhova, for a score of 14.633/6.1. Second was Russia’s Elena Eremina, who also showed great difficulty, including a Nabieva linked to a Pak salto, for a score of 14.300/6.0. Tying for third place were Great Britain’s Ellie Downie, who was on fire, and Germany’s Elisabeth Seitz, both with a 14.133/5.9. The competition was marred by Becky Downie’s elbow injury, falling on her Gienger. She was able to walk away on her feet, and hopefully it is not too serious. It was also sad to see France’s Mélanie de Jesus dos Santos failing to deliver her bears set, after competing beautifully in qualifications and in the all around. Her lines are exceptional, she could have fought for a medal. The balance beam final was a bundle of nerves and emotions. Romania’s Cătălina Ponor delivered a beautiful set to win her fifth European title on balance beam (14.566/6.2). For Ponor, this victory was special because it happened in front of her home crowd, and when the score came out, she burst out crying…and kept crying all the way through the competition and the award ceremony. The announcer rightly introduced her as ‘the queen’: Ponor mounted the beam aggressively and did not have one single wobble, until a big step on her double-pike dismount. Second was the Netherland’s Eythora Thorsdottir, who finally (finally!) hit her beautiful routine for a 14.066/5.6. It was nice to see the ever-poised Eythora release her body tension and happily punch the air at the end of her routine! Her balance beam work is charmingly elegant, she is the only gymnast to actually dance on beam – amazing! Third was an emotional Larisa Iordache for Romania (13.966/6.0). Iordache had a beautiful, confident and wobble-free routine until the dismount, when she over-rotated her triple twist and had to take a few huuuuge steps back. She looked defeated and heart-broken, this competition clearly meant so much for her. Her tears during the award ceremony were a sign that a bronze medal was not what she had wished for, but the crowd sweetly cheered her on, and hopefully this will motivate her to overcome the difficult moments and keep working hard. The 2016 balance beam Olympic champion Sanne Wevers from the Netherlands finished fifth after some significant wobbles in her routine (13.341). Too bad also for France’s Marine Boyer, who had a fall on her acro series (she would have medalled for sure without it), and for Germany’s Tabea Alt, who suffered two falls. Alt, however, was forced to withdraw from the all around final a couple of days ago because of illness and was probably still a bit under the weather. The floor final was stellar, with eight hit routines and big smiles (almost) all around – the women were on fire. Russia’s Angelina Melnikova, after a rough week, found somewhere in her heart that fighting spirit only real Russian champions have, and delivered a beautiful routine, to win her first individual European title (14.100/5.4). She was so happy at the end of her routine that you could be cheer for her! 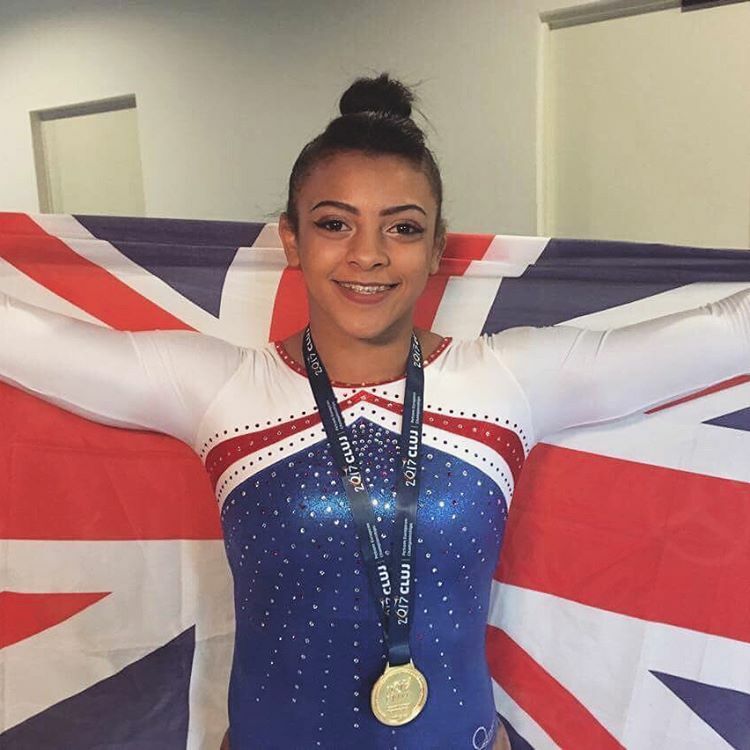 Second was Great Britain’s Ellie Downie (14.066/5.4), who has had the championships of a lifetime, with five medals and 12 out of 12 hit routines – impressive! Third was the Netherland’s Eythora Thorsdottir with a routine the announcer introduced as ‘kind of an art’ – so true! Thorsdottir stepped out of bounds on her triple twist to punch front, but the rest of the routine was gorgeous and she deserved her bronze medal. The rest of the competitors’ scores ranged from Elena Eremina’s 13.466 to Kim Bui’s 13.566, which shows the depth of European floor workers. Too bad only for Claudia Fragapane, who over-rotated her double Arabian and finished out of bounds. The rest of the routine was as good as it could get, and her new dance is superb – next time! Overall, European gymnastics is in a great spot right now. France and Hungary had an amazing championships, gaining two medals each: France won gold on vault with Coline Devillard and bronze in the all around with Mélanie de Jesus dos Santos, and Hungary won silver in the all around with Zsófia Kovács and bronze on vault with Boglarka Devai. Great Britain found in Ellie Downie a great champion and their best ever all arounder. Their other gymnasts, both those in Cluj and those at home, have great potential as well, and team GB will most likely consolidate its position as one of the top teams in the world this quad. Belgium also found its champion in Nina Derwael, who is set to become one of the top bars workers in the world, and the Netherlands showed once again that artistry produces medals too, as Eythora Thorsdottir won silver on beam and bronze on floor. On the other side of the spectrum, however, the two European powerhouses, Russia and Romania, struggled to find their depth. For Russia, it seems more a question of confidence, time and health. Melnikova, Eremina, Paseka, Kapitonova, as well as Spiridonova, Tutkhalian and others, all have the potential to be world-class athletes, as long as they stay healthy and control their nerves. I particularly hope that Melnikova’s floor title will make her regain that confidence she had until spring 2016. If she does, she will be a big contender for world medals this quad. For Romania, things are a bit more complicated. The Romanian team is still relying on its veterans Ponor and Iordache, while the new generation of gymnasts does not seem to be able to break through. In Cluj, cameras followed attentively Nadia Comaneci’s moves as she sat among the public. It was a proud reminder of the past greatness of Romanian gymnastics. Hopefully, the Romanian federation will soon start dreaming also about the future, rather than just about the past, and will be able to produce new talents, and make us dream as big as Nadia again! The European all around competition was held in Cluj-Napoca, Romania, on 21 April 2017. The all around crown was won by Great Britain’s Ellie Downie (55.765), who made history, becoming the first British gymnast to win an all around European title, as well as an all around title in any major international competition. Downie’s best score came on vault, where she scored a 14.533 for a clean double-twisting Yurchenko. She also scored a very good 14.300/5.9 on the uneven bars, where she had only tiny form breaks throughout, a 13.066/5.3 on beam for a very good set, with only one major break on her double spin, and a 13.833/5.5 on floor. Her new floor routine, which includes a difficult double-double and a one-and-a-half twist into double Arabian, suits her very well, and today she performed it fine, only finishing a bit short of her double Arabian. Downie trailed silver medallist Zsofia Kovacs from Hungary all the way through the competition, but got the edge on floor exercise. Kovacs had an outstanding competition (55.432), which started on vault, where she almost stuck the most beautiful double-twisting Yurchenko of the day (14.600). Kovacs also performed a very good routine on the uneven bars (14.333/6.0), with only tiny form breaks and a big step on landing, and was the only gymnast of the top-group not to have major form breaks on beam (13.466/5.1). On floor, she performed a clean routine for a 13.033, but her low difficulty (4.9) did not allow her to keep up with Downie’s 5.5. Third was France’s Mélanie de Jesus dos Santos (55.065), who is a beautiful gymnast with loads of power and potential on all apparatuses. De Jesus dos Santos started her competition on bars, where she scored a 14.100/5.8, which seemed slightly underscored, as she certainly had the best execution among the three top gymnasts and stuck her super difficult full-in layout dismount. De Jesus dos Santos also posted the highest score of the day on beam (13.833/5.8) and the third highest score on vault (14.366/5.4), which sealed her bronze medal. She also scored a 12.766/4.9 on floor, for a routine with a lot of difficulty and plenty of power she still needs to learn to master. But overall, what a performance, she has a bright future ahead of her! Junior European champion Elena Eremina of Russia finished fourth (54.266), after a costly fall on beam on the very first element. Fifth was Germany’s Kim Bui at almost thirty years old! (53.499), sixth was Italy’s Martina Maggio (53.199), seventh was Belgium’s Nina Derwael (52.832) and eighth was Portugal’s Filipa Martins (52.832). The first Romanian gymnast was Ioana Crisan, who finished eighteenth (51.032), which shows that Romania’s issues with team depth, especially in the all around, are still to be solved. It was a disappointing day for the Netherland’s Eythora Thorsdottir, who finished twelfth (51.965), after disastrous performances on bars and especially on beam. She however finished strong on floor, with a 13.533, the second best score of the day. It was a disappointing day also for Russian champion Natalia Kapitonova, who finished ninth (52.766), after a poor 11.900 on beam. Overall, despite the inevitable mistakes at such an early stage of the season and of the quad, the level of the competition was high. There was only one score below 50.00, which is an excellent prospect for the future. Four years ago, there were several scores on the 49-range, and this with the old scoring system. It was also very nice to see that none of the three medallists counted a fall, a recurrent problem in the 2009-2012 quad. Finally, for the first time in ages there was no medallist from the two European powerhouses, Russia and Romania. If this was, on the one hand, quite sad and vaguely worrying, on the other hand, it was nice to see the rise of smaller programmes, such as Great Britain and France, and of excellent individual gymnasts, like Kovacs. Event finals are coming up this weekend, stay tuned!